Here's one of our biggest sales of the year, 15% off everything site-wide, and Free Shipping to the first ten orders! That puts a Stage 2/2X TurboSystem with FullRace Exhaust at $3230, regularly $3800. Hahn QA1 Coilovers are $764 for double adjustable, $976 for triple adjustable. Supplies are limited, so move fast to get these deals and Free Shipping! Click Here for the BIG BOOST BLOWOUT SALE! Edited once, last by Bill from Hahn RaceCraft ( Aug 20th 2017 ). And the Monday Bump! Still some slots left for Free Shipping...save BIG! How much is it for the new intake set up? That really intrigues me. Ah, you must be referring to this mythical new development that recently surfaced. Am I correct? That's our new Slingshot version of our proven Ecotec StreetRace intake manifold, soon to be released. In this instance, it is also paired with our PortFueler EMS (Engine Management System) which would account for the additional four injectors shown. Edited once, last by Bill from Hahn RaceCraft ( Aug 22nd 2017 ). Will it work with the current Turbo kits out? Absolutely. One can simply swap out the stock intake manifold for the StreetRace manifold. The swap will also include lengthinging the some wiring, as well as trimming the intake pipe, but these are simple enough tasks. Humpday is BUMP Day for the Big Boost BLOWOUT! Still a couple Free Shipping spots left, but better hurry if you want to get both 15% off AND Free Shipping! Thursday Bump! Only a couple Free Shipping spots left...thank you to everyone who has saved BIG in the BLOWOUT SALE so far! Slingshot Complete TurboSystems: starting at only $2295! 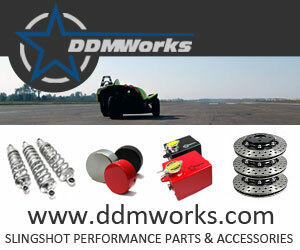 Adjustable Spherical Coilovers for Slingshot: as low as $764! EVERYTHING IS ON SALE! Just use discount code "BLOWOUT" at checkout to save hundred$! The sale ends at midnight on Thursday August 31, so don't miss out on the hottest deals of the summer. Visit www.hahnracecraft.com to learn more and SAVE BIG! A resoundingly big THANK YOU to all who took part in the BIG BOOST BLOWOUT SALE! It's done and in the books now, but I'm still feeling mighty frisky. We may well do a Labor Day Weekend special next.